Milwaukee Belt Sander - Everything about heavy duty!! Milwaukee Belt Sanders are one of the 500 quality products from this prestigious company. Along with belt sanders they produce other models of orbital palm sander and random orbital sander. Sanders are aggressive machines which sand down wood. They also strip paint and other finishes from wood. They are used in the first stage of sanding process, where enormous amount of wood has to be removed for example in doors and wood furniture. These sanders consist of two main components: an encased electrical motor with a circular belt (2 rotating drums) on which fine grit sand paper (80 grits here) is spread. They are firmly held in order to fit in the belt and are stretched completely. The loop of paper moves in way reminding us of a mini-treadmill. The easiness by which the entire area is sanded is its specialty. This Milwaukee Belt Sander is one of the most powerful sanders. May it be the home usage (shaping outdoor patio furniture or to smooth the doors during summer) or usage to remove polyurethane coatings, this workhorse is a time saver. It is used to smoothen wood or remove a fraction of metal from wood. Professionals would love to lap it up. 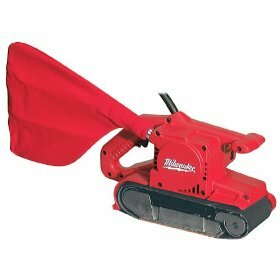 The 4 "× 24" Milwaukee Belt Sander is the only product in Milwaukee sander category. This is powered by a 10 amp motor which provides fast and nonstop sanding. The centre of gravity of this tool is help for optimum balance and control. The housing design allows flush sanding and hence can be used in vertical surfaces. They have one of the sturdiest release levers. These levers flip up or down, releasing or fastening the sand paper. These levers help especially while changing sanding belts. The voltage that it works on is 120 AC/DC and produces 1400 surface feet per minute. Any power rating (10 amps) should couple with the times the belt turns. Since this is 1400 sfpm, the users have found it quite heavy duty. The tool has been in use for more than 10 years and it presence for such a long time is the proof of its strength. The tool is heavy. This has enabled proper surface control. It has rubber coated rear pulley for full traction when it is under pressure. They are quite strong and have the full belt traction under very heavy pressure. There has always been some contention among wood workers about the tension and the angle control. The belt should not move out from the rollers when its operating under uneven pressure or while sanding only a part of the belt. Milwaukee Belt Sanders can easily be set for the tension and the angle and the belt tightly remains in place irrespective of the condition it faces. Arguably the Milwaukee Sanders are one of the pioneers in their peer group and still has its head high with the exceptional grip qualities and its power - No wonder it's the standard for the competitors! Return From the Milwaukee Belt Sanders Page to Home - Finishcarpentryhelp.com.